I stare in disbelief at the two-tone screen of the GPS. In the past 24 hours we’ve lost forty-two miles west, and gained only a handful south. Disaster looms once more. To avoid running aground on the reef east of Tagula, we need to make fifteen miles south over the next fifteen hours. The likelihood of this happening is slim given the recent trend. All we can do different is try to increase our RPMs. April ups hers from forty to forty-five. I aim for fifty-two. We also shorten the daytime shifts from three to two hours, and the night-time ones from four to three to optimize performance. “It’s like pushing a loaded wagon up a hill,” April remarks, her knees visibly straining. Good old April, I think. At the next shift change, I power up the GPS. April sits on the passenger seat, anxious to hear whether she’s achieved the all-important one-mile-south-per-hour ratio. I read off the latest coordinates, and pencil them onto the Admiralty chart draped over my knees. April stops pedalling to hear the verdict. It’s the first time in three days the cranks have stopped longer than the sixty odd seconds it takes to switch positions. Missing Tagula Reef is huge, putting us back on track to reach Cairns. 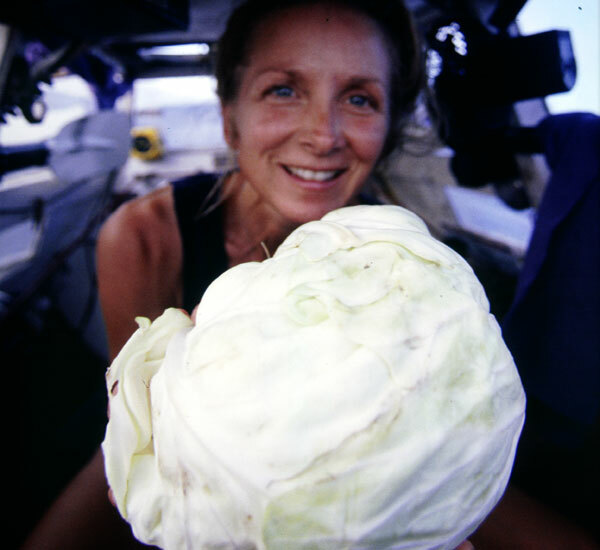 As promised, I extend to April the honour of being the first to sample The Cabbage, which we’ve been saving as long as possible. She unlashes it from the cabin roof, and delicately peels away the spoiled, outer leaves, revealing a pristine inner membrane that glistens with the polished luminosity of a living brain. This entry was posted in The Seed Buried Deep excerpts and tagged adventure, circumnavigation, Coral Sea, human power, travel, voyages by admin. Bookmark the permalink. I love your stories! They read in a way that makes it easy to pretend I’m there too. I wish I was! I’m really looking forward to your first book coming out in UK. So sorry that I couldn’t give it to everybody for Christmas. Can I simply say what a reeilf to discover someone who actually knows precisely what theyre speaking about on the web. You actually understand how to bring a concern to light to make it important. Lots more people should look at this and appreciate this side of the story. I cannot believe you are not more popular since you definitely hold the gift.